Released on 8 September 2014 as a DVD or SD Blu-ray. This concert was simultaneously released as an album, as a single disc featuring the November show, or as a double disc which adds the March show. The tracks on the DVD and Blu-ray are identical to the album, with the exception of 'Procession', which features a slightly shorter introduction on the DVD and Blu-ray. The album page includes the full lyrics and differences of all tracks. The main feature is the full concert recorded at the Rainbow Theatre on 19 and 20 November 1974, lasting 79:32. It begins with footage of the band arriving at the theatre, and backstage, while the opening credits appear at the start of 'Now I'm Here'. At the end of the show, as 'God Save The Queen' plays, there is footage of the empty stage and audience, as the credits are shown. The bonus feature contains tracks recorded at the Rainbow Theatre on 31 March 1974, lasting 10:27. The concert was filmed by the BBC for 'The Old Grey Whistle Test' programme, but ultimately only four tracks were broadcast, which is the only footage known to exist. At the end of the feature, there is an appeal for information regarding the full length footage which may be in the hands of collectors. On both the DVD and Blu-ray, the menus feature a simple lighting rig effect, with audience noise. The main menu has four options, namely play, song selection, bonus tracks, and audio options. The last three open as pop-up menus on the Blu-ray, and as seperate sub-menus on the DVD. The audio options menu allows you to choose between LPCM Stereo and DTS. There are no subtitle options. The main concert was originally released, in part, on the 1992 video 'Live At The Rainbow', which was exclusive to the 'Box Of Tricks' boxed set. At 52 minutes long, it omitted five tracks in their entirety, while six were edited. Some of the tracks were also re-arranged, to produce a fake medley, containing 'Son And Daughter', Brian's guitar solo, 'Father To Son', Roger's drum solo, 'Keep Yourself Alive (reprise)', 'Liar', and 'Son And Daughter (reprise)'. Comparing the two releases, the video footage is almost identical, retaining the same camera shots and edits, with some minor differences in places. In terms of audio, most tracks are the same, but the most noticeable difference is 'In The Lap Of The Gods.... Revisited', which has a different introduction and different lyrics throughout, so presumably the two released versions come from different nights. There are some other minor differences throughout, again mostly with introductory dialogue, although the 1992 video also features a number of vocal overdubs, for instance during 'Liar' there are some additional backing vocals, but the video footage shows that nobody was singing at that point. An edited version of the concert, titled 'Queen At The Rainbow' and lasting 32 minutes, was shown in cinemas alongside other films, including 'The Hustle', Led Zeppelin's 'The Song Remains The Same', 'Jaws II', 'Saturday Night Fever' and the Pink Floyd films 'Live At Pompeii' and 'The Wall'. 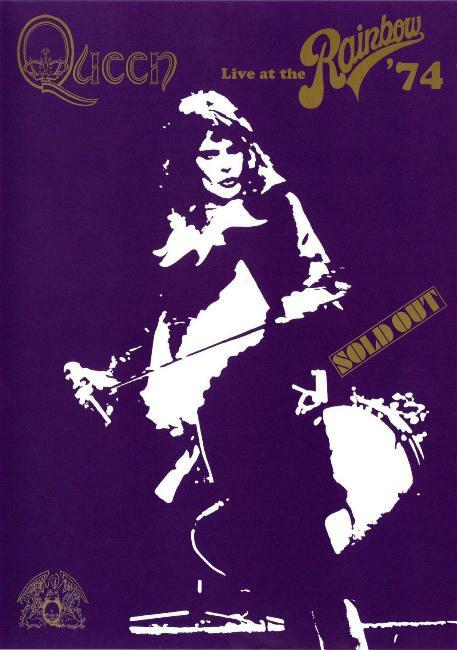 This version was obviously derived from the same tapes used for the 'Live At The Rainbow' video, and included 'Procession', 'Now I'm Here', 'White Queen', 'Killer Queen', 'The March Of The Black Queen', 'Bring Back That Leroy Brown', 'Father To Son', 'Keep Yourself Alive', 'Liar', 'Stone Cold Crazy', 'In The Lap Of The Gods.... Revisited' and 'God Save The Queen'. Several of the tracks on the release have been issued before. 'Now I'm Here' was included as a promo video on the 'Box Of Flix' video and 'Greatest Video Hits I' DVD, while the video footage (but not audio) was included on the 'Queen Rocks' video. 'White Queen' was available to stream as part of the 2009 'Absolute Greatest' release, and as a bonus video on the 2011 iTunes LP reissue of 'Queen II'. Excerpts of 'Seven Seas Of Rhye' were included in the promo video for the track on the 'Days Of Our Lives' DVD and Blu-ray. 'Liar' was included on the 'Queen' iTunes LP reissue, while excerpts also appear on the 'Rare Live' video. Finally, 'Stone Cold Crazy' appears on the 'Rare Live' video, the 'Sheer Heart Attack' iTunes LP reissue, all formats of the 'The Miracle' single (as audio only), and the 'Queen Rocks' video (as video only), with some footage making up the 'Classic Queen' video. All of these versions are taken from the 'Live At The Rainbow' version and are edited accordingly. The first 30 minutes of the show were available online on 5 September, 3 days before the official release, as part of the 'Freddie For A Day' celebrations. Footage of the support band Hustler was also uploaded to Youtube as part of the promotion.